I became a bit obsessed with the concept of dump cakes, but not the reality. Let me explain. One Google pass at the term and what comes up again and again and again are cakes using goopy sweet canned fruit, cake mixes and the like. Not the way to celebrate fresh fruit in my opinion. 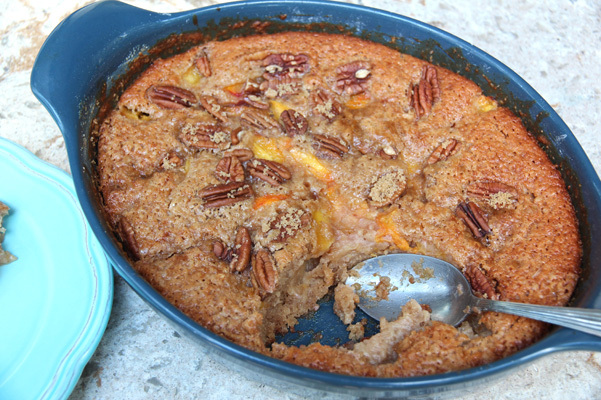 So I decided to develop a peach or nectarine dump cake using scratch ingredients and technique. 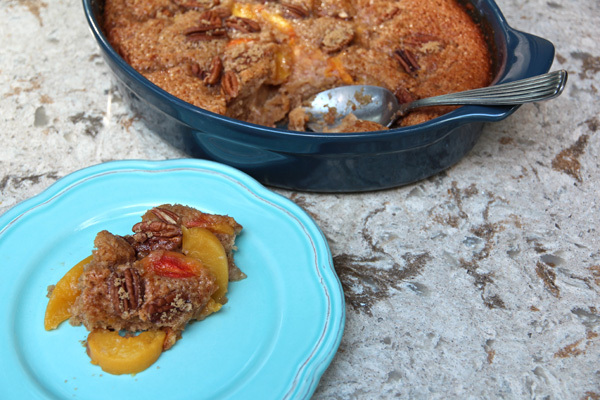 This bakes up with a simple cake base, a “peaches and cream” flavor profile rounded out with brown sugar and pecans. Super easy and so much better than using canned fruit. Place butter in pan and place in oven to melt butter. Remove from oven and place on rack or heatproof counter. Whisk in sugar and ½ cup of the brown sugar, then whisk in eggs and spices. Add flour, make a few strokes with your whisk, then add milk and cream, baking powder and salt and whisk until combined. 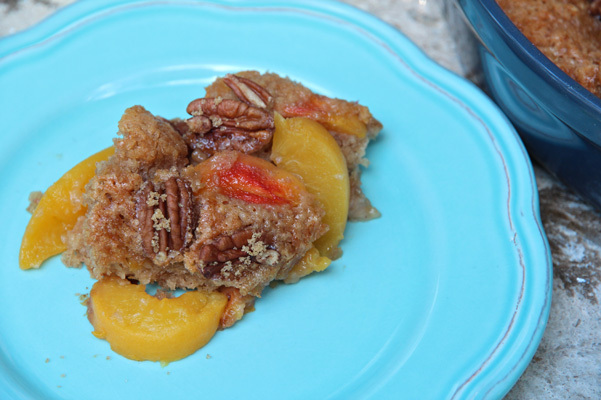 Scatter peaches or nectarines on top, followed by pecans and then remaining ¼ cup brown sugar. Bake for 40 to 45 minutes or until cake is golden brown and a toothpick inserted in the middle shows a few moist crumbs clinging. Cool on a rack until warm. Serve warm or room temperature. A little bit of unsweetened or lightly sweetened whipped cream is a nice touch. Store covered with aluminum foil at room temperature for up to 2 days.